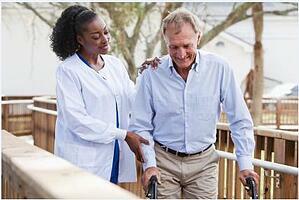 This post is part of a multi-part series on homecare best practices for Parkinson’s Care. To view our previous post on nutrition click here. Some people have the misconception that caring for a loved one with Parkinson’s means that the patient is bedridden for the rest of his life. This could not be further from the truth; in fact studies show Parkinson’s patients who are kept completely inactive fare much worse than those who maintain a regular level of activity. However, caregivers do need to be aware of how much activity is “too much” and when caution is needed. With proper training and a dependable home care software, like that provided by ClearCare, it easier than ever for caregivers to monitor the activity of Parkinson’s patients. An integral part of helping Parkinson’s patients adjust is by ensuring they maintain their independence. Although Parkinson’s tends to strike people aged 50 and older, the disease does not discriminate. Symptoms can begin appearing in patients as young as 30. Independence is especially important to younger individuals managing a diagnosis, thus caregivers will to address sensitive care issues with respect. By using a home care system and home care software caregivers can discreetly check what tasks the patient needs help with and how best to offer suggestions regarding daily activities. Current treatments for Parkinson’s care help patients manage their symptoms and stay active longer. Caregivers that utilize ClearCare’s home care software can make note of the patient’s medications, rehabilitation sessions, and other therapies so that they can help the patient stay current with such necessary treatments. Relying on a home care system to help treat the symptoms of Parkinson’s can help the patient better cope with his illness. This becomes especially important as Parkinson’s symptoms worsen. When a patient already has a caregiver he trusts, he will be more at ease receiving additional care. Although Parkinson’s disease is degenerative and mobility issues will eventually result in the majority of cases, caregivers can help patients ward off disability by encouraging regular exercise. Agencies can note in their home care system which clients need reminders for exercise, and caregivers can refer to their home care software regarding which activities each client prefers. No two Parkinson’s patients are the same. When caregivers have the advantage of an industry-leading home care system, such as ClearCare, tracking individual patient care is simple and straightforward. While one client may prefer walks around the neighborhood, another may enjoy swimming at a local pool. Caregivers can check their home care software prior to each shift to make plans for whatever activity the client needs to help maintain mobility. With the help of a resourceful home care system, and dedicated caregivers, Parkinson’s patients can stay comfortable in their own homes, maintain their independence, and stay physically active.